These maple-glazed parsnips are so sweet that they actually seem more like eating a dessert than eating a vegetable. And, believe me, I love dessert and I’ve always had a serious sweet tooth, so that’s not something I say lightly! 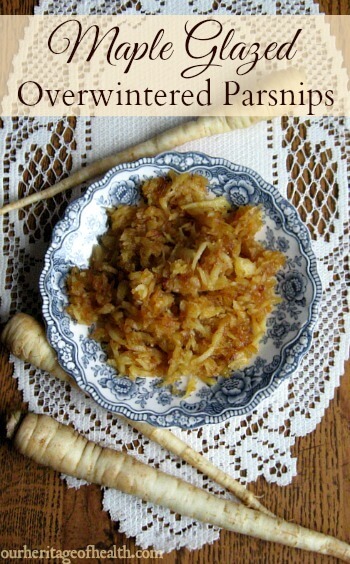 I know, it sounds pretty crazy to say that you can make a buttery, caramelized, dessert-like side dish out of a vegetable that you usually find in savory soups, but there are two main keys to creating a flavor that’s sweet rather than parsnip-y. The first key is to use overwintered parsnips. Overwintered parsnips are ones that have been dug up in the spring after being left in the ground for the winter time. The cold temperatures help to increase the natural sugars in the parsnips, making them sweeter the longer they stay in the ground. You can try this recipe with fall parsnips if you want, but you’re best bet for sweet parsnips would be ones that weren’t harvested until after the first frost, and for the sweetest flavor, it’s best to wait for the spring. You aren’t as likely to find overwintered parsnips in a regular grocery store, but many local farms and farmer’s markets have them out this time of year, and you might be able to find them at a specialty foods store. I found mine at Hutchin’s Farm – an organic farm that I’d highly recommend to anyone within driving distance of Concord, MA. The second key to sweet parsnips is to grate them so that they’re shredded rather than chopping them like you would with carrots. 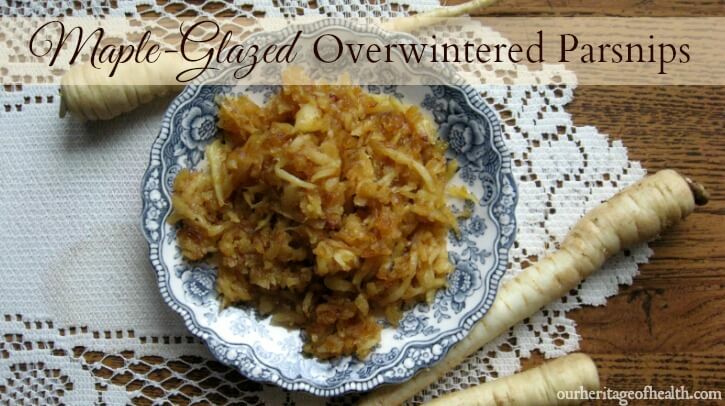 I think this might actually be more important than using overwintered parsnips because the smaller pieces of grated parsnips allow the maple flavor to fully soak into them, whereas if you were to use chopped parsnips then the maple flavor might only soak into the outer edges and the core of the slice would still be a stronger parsnip flavor. That and sliced parsnips take much longer to cook, too. This recipe is really easy and fast to make and it uses only four simple ingredients (unless you want to have fun customizing the flavors with other ingredients.) I made these this afternoon and it only took me about 20 minutes total to go from fresh-from-the-farm parsnips to a sweet side dish/dessert. Peel parsnips and grate them until they are shredded. Saute grated parsnips in a skillet with butter on medium heat, stirring regularly, until they are golden brown and cooked through. About 10-15 minutes. Add salt and maple syrup, stirring well, and saute until caramelized. About another 2-3 minutes. The grated parsnips burn quickly if their not stirred often enough. You don’t need to stand by the pan and stir continuously the entire time they’re cooking, but you want to make sure to check back often and give it a quick stir if you’re multitasking, especially once you’ve added the maple syrup. Leaving the pan alone for more than a couple of minutes could leave you with burnt parsnips. These parsnips are delicious as is, but if you wanted to make them even closer to a dessert, you could try adding some cinnamon or nutmeg, (or both), or some toasted pecans. Or, if you wanted to make them a little bit more savory, you could try adding some sage and thyme to balance the sweetness. These maple-glazed parsnips are a perfect base for whatever flavors you prefer. Excellent recipe, simple and quick. I look forward to making some of these.